Nice little cookie or treats jar. 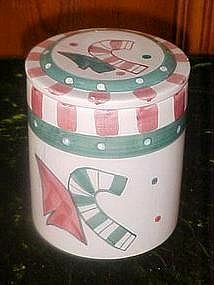 All hand painted with candy canes and festive stripes and polka dots. Made of glazed ceramic. Made by Cookie Keepers, China. Measures 6" tall and is in perfect condition.